This game is like shuffleboard in the round. Players take turns flicking disks on a board, trying to score points by attaining central regions. 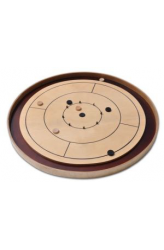 The main stipulation being that contact with the other teams' pieces must be made in order for the disk to remain on the board afterward. Although the game uses quite a bit of skill to flick the disks, there's a very significant strategy element to the game. There are many different variants and rules, as this game is very old and has had many different incarnations over the years. https://www.youtube.com/watch?v=isudfD7dcXI ..
A true Worldwide Success! 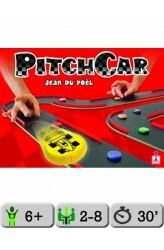 Pick your car, build your own track and use the flick technic to propel your racing car. Take the best trajectories using the safety railings, remain on your wheels and don’t get out of the track or the penalty won’t be far! A beautiful creation, this dexterity game, made of wood is composed of 16 portions of track, allows you to make a multitude of different tracks with a length of 3.90 meter. 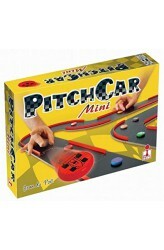 https://www.youtube.com/watch?v=sd6WC9fBSPo ..
A mini version of Pitchcar with smaller track pieces. Contains 6 straight and 10 curve track pieces that allow the construction of more than 10 different racing circuits. 8 wooden cars are included as well. https://www.youtube.com/watch?v=nVvjhrvn-Gs ..